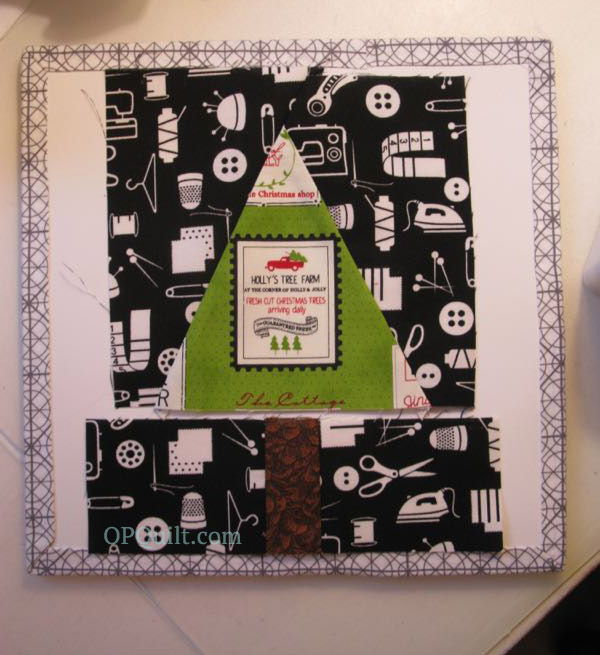 Christmas Tree Block Swap | OccasionalPiece--Quilt! 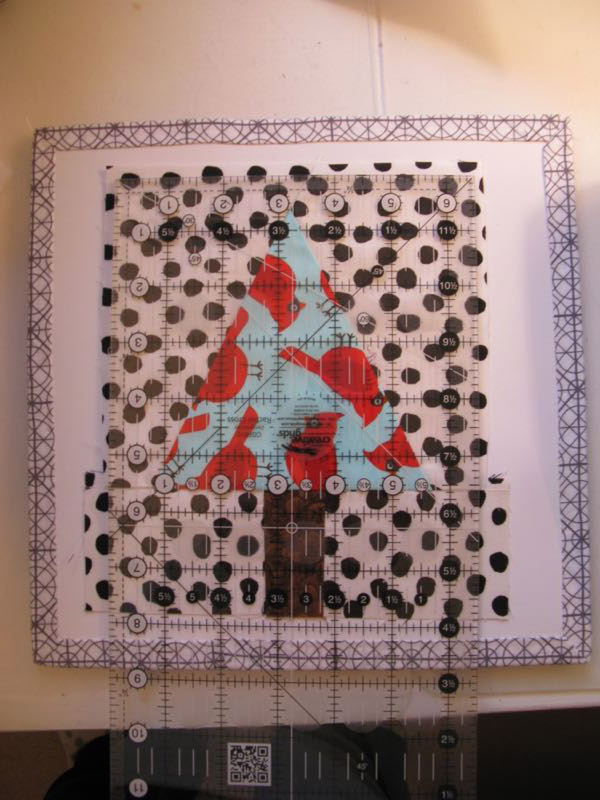 I drafted a pattern, just drawing this way and that, then made up a test block. My graphic design guru Simone approved it, and we were off. 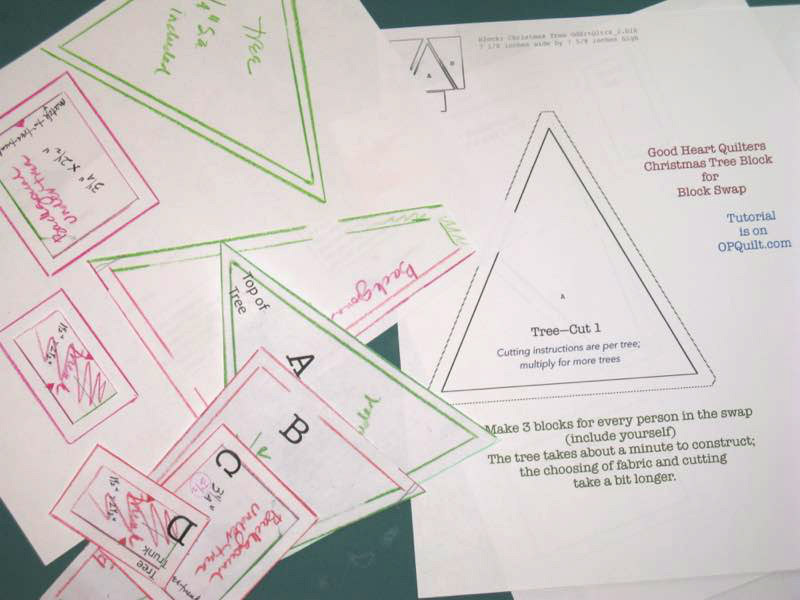 I transferred my dimensions to Quilt Pro, my quilt software program and here it is for you to download: christmas-tree-gdhrtqltrs-swap_pattern That’s FREE, no charge, but as usual, please don’t print off one for your mother or your sister, but instead, send them here to get theirs. Many thanks. AND…as a reminder. 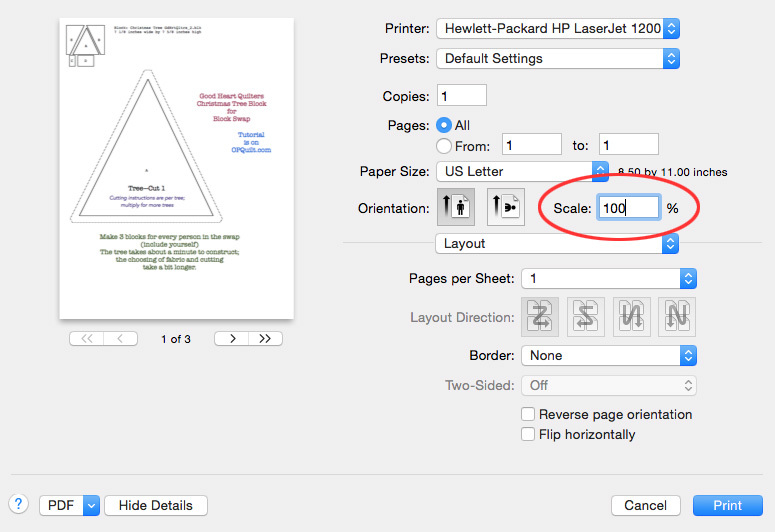 Please be sure to set your scale to 100%, as shown above in the red oval. I also apologize for filling up your mailboxes with two posts so close together. 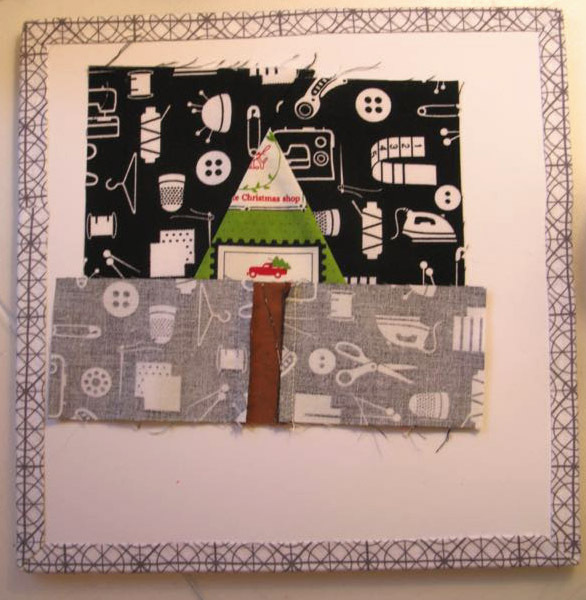 But then again, you might need this too, to spread a little holiday cheer around your sewing room. 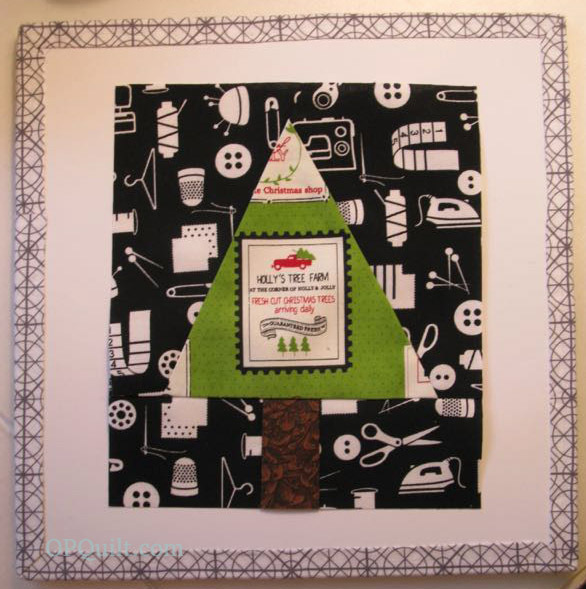 Sew the Upper Background piece onto the tree. 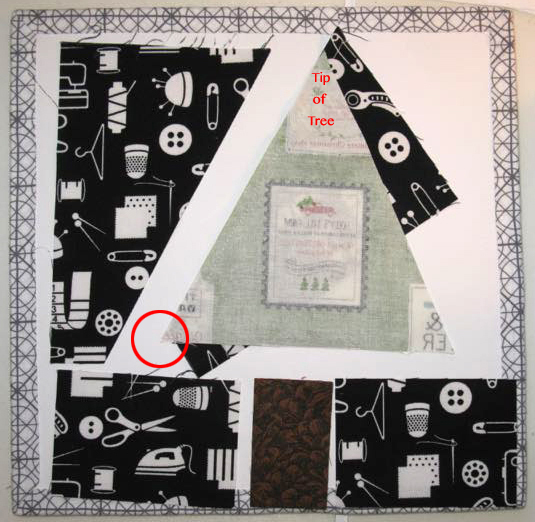 Leave that tiny wedge of 1/4″ goodness at the bottom right corner (shown in the red circle), and let the top of the upper background just hang off the tree. 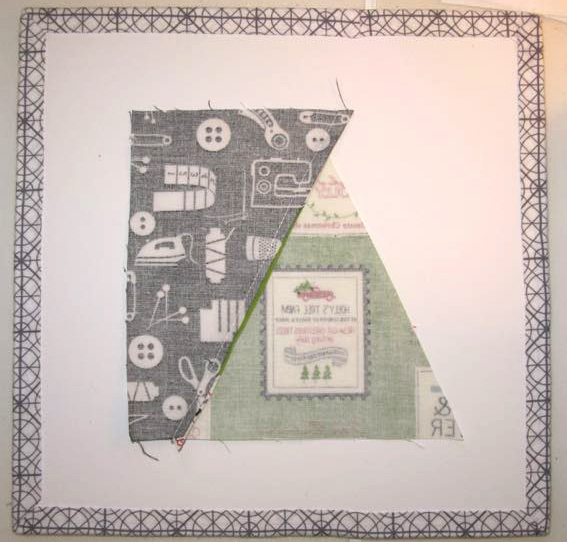 Stitch 1/4″ seam. Backside of that piece. Now the 1/4″ wedge of goodness is at the lower left, and the extra background is at the top. 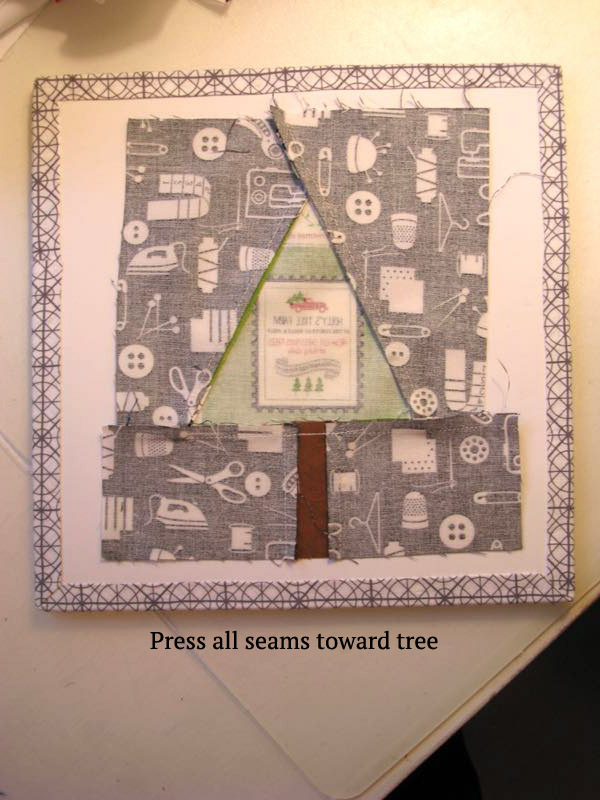 Press seam towards the tree. Trim off the extra point. Press towards tree (see below). Seam the Lower Background pieces on either side of the tree trunk. Press towards the trunk. Line up the tree trunk with the tip of the tree, to get it on straight. I’ve left a bit extra on either side, so if you want it wonky, feel free. Press all seams toward tree. You can see here the extra I’ve left you so you can adjust the trunk as needed. 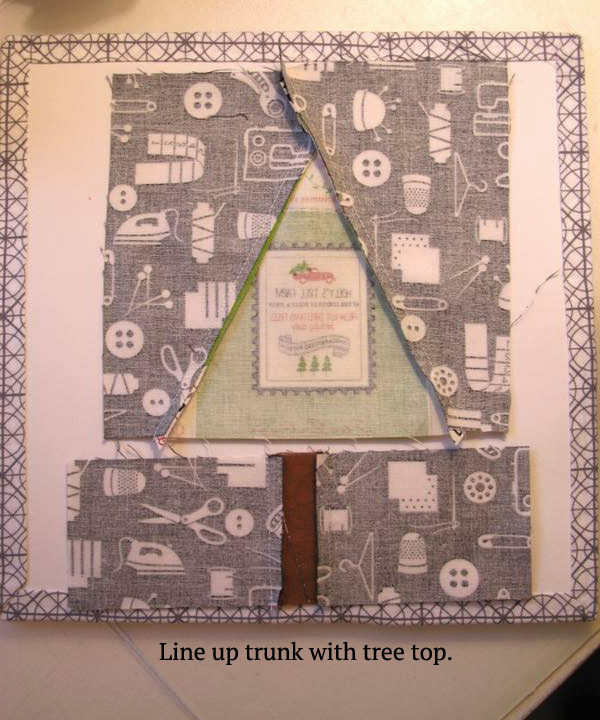 Trim the block to 6 1/2″ by 7 1/2″ like this: Leave space above the tree tip, roughly 3/4″. Then whack off the bottom, so the total height is 7 1/2″. This tree will finish at 6 by 7″. 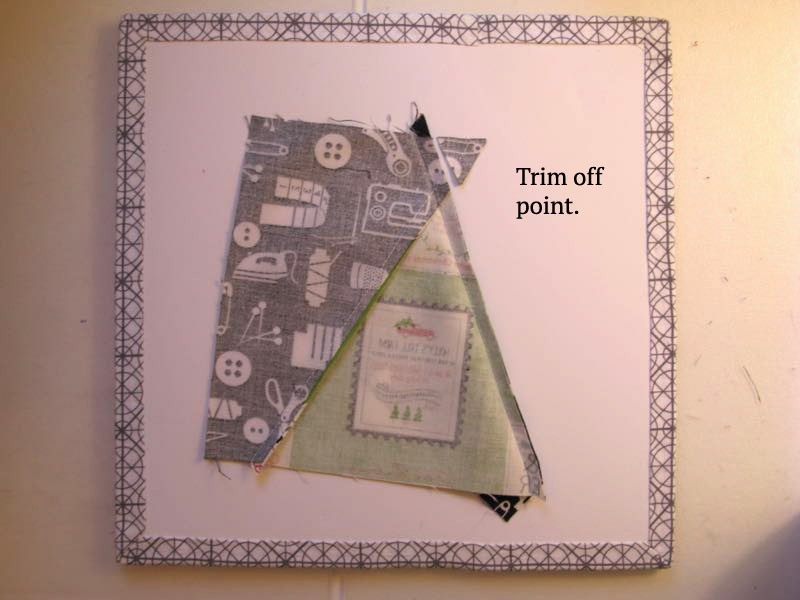 Fussy cutting is always encouraged. 1-Layer two pieces of fabric with wrong sides together (like it comes off the bolt). 2- Cut a square 5 1/4″ by 6 1/8″. 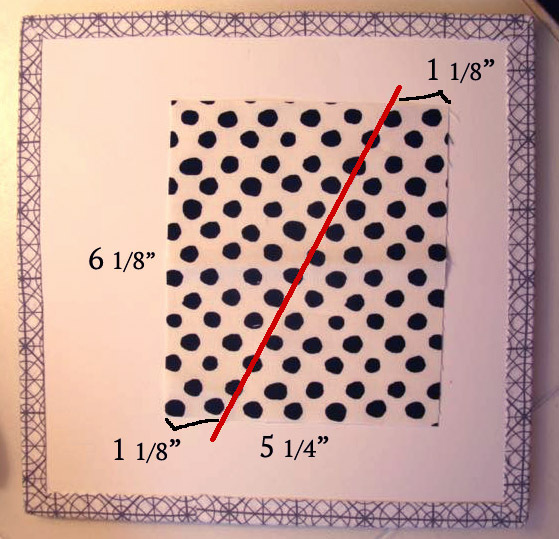 3- Measure up 1 1/8″ on opposite sides, and draw or cut a diagonal line. 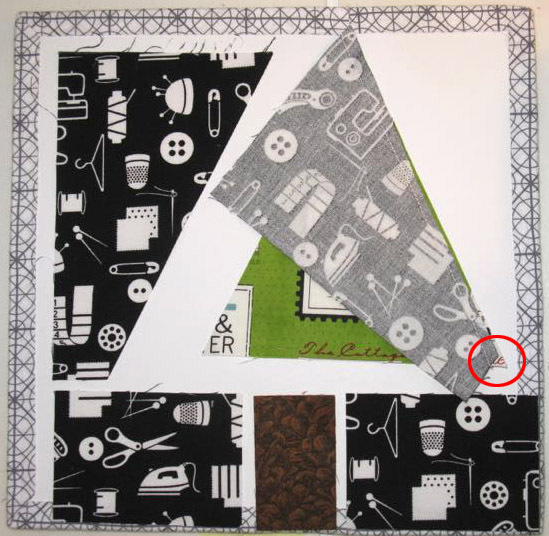 It should be the same size as your piece B or D.
Remember that these pieces are opposite of each other, so don’t layer up your fabrics with all right sides up, or this won’t work. Here’s my first batch. Now I’ll go do this some more. Have fun making a forest! As cute as can be! I love these trees. Very sweet trees, thanks for sharing…..but isn’t it still September? It certainly can’t be very close to Christmas, or I would be so much more ready….sigh…maybe one year…. Those are really cute. Thanks for the tutorial. What a nice tutorial, Elizabeth! 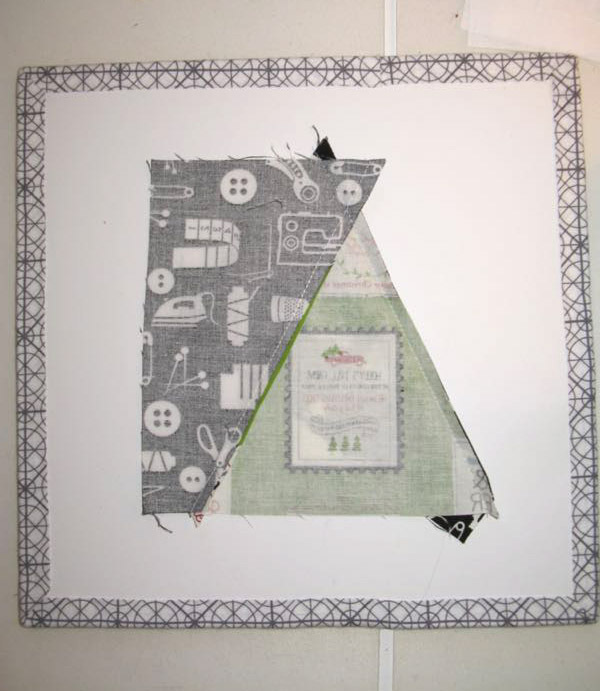 I’m sure lots of quilters will find it helpful. 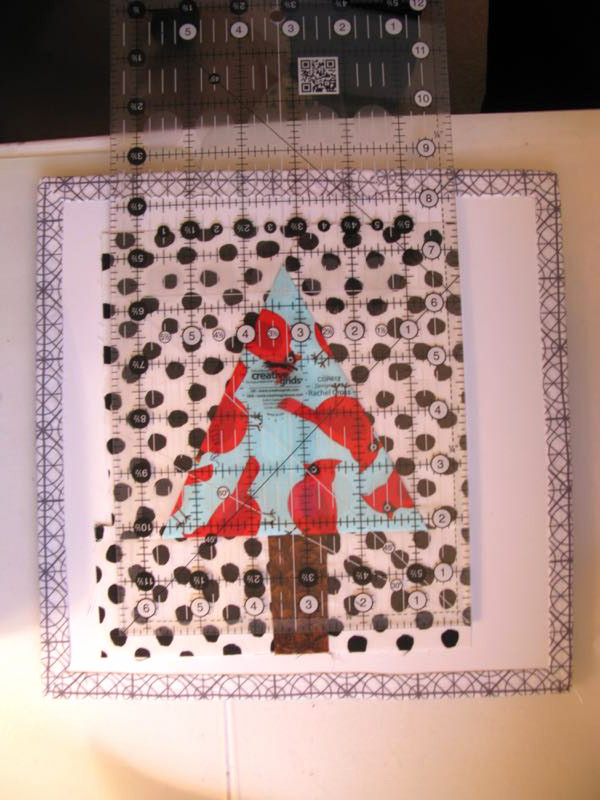 Since we haven’t decorated for Christmas for eight years now, I don’t think I’ll be making this. But it’s sure cute! Cute trees, have fun making your forest grow and swapping them. So cute. So easy. Thanks! These look like lots of fun. 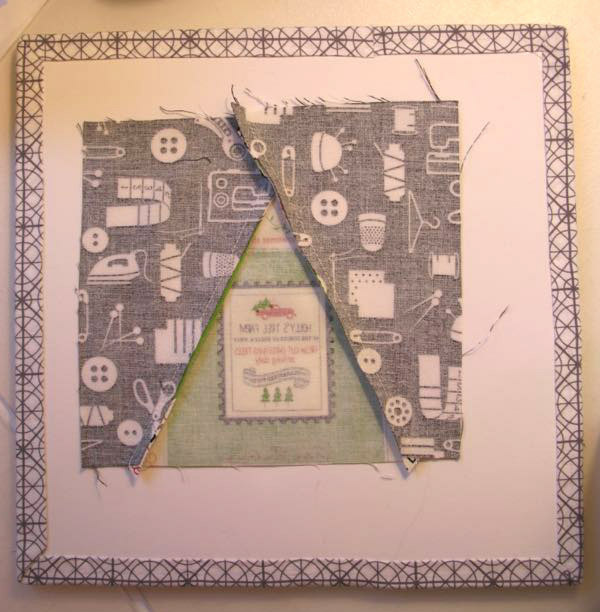 I would love to be part of a quilting group like you have. 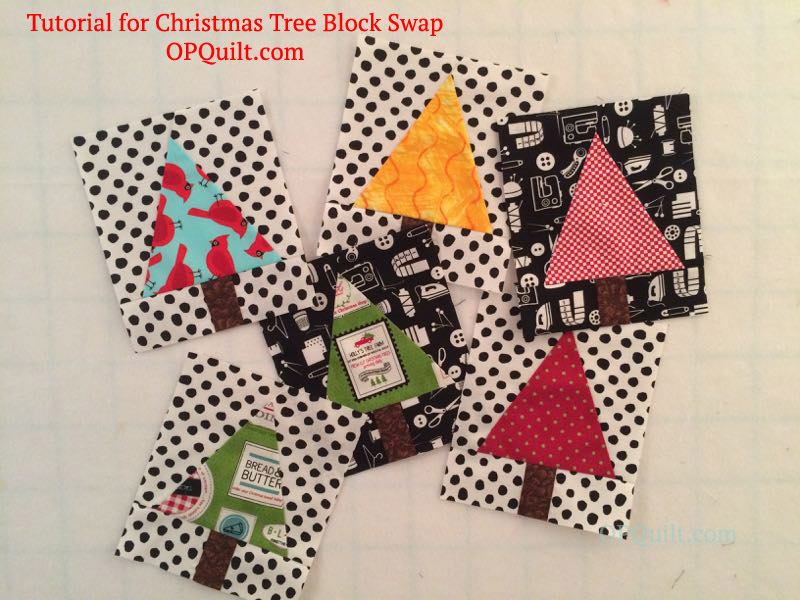 Pingback: Christmas Tree Block Swap | OccasionalPiece--Quilt! Thank you so much for sharing your lovely tree block. 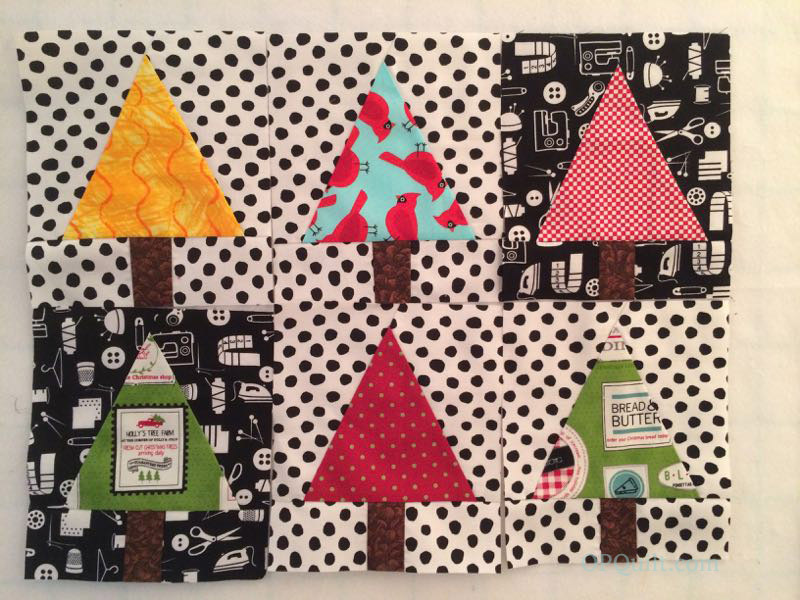 Pingback: Tiny Tree and Teeny Trees | OccasionalPiece--Quilt! 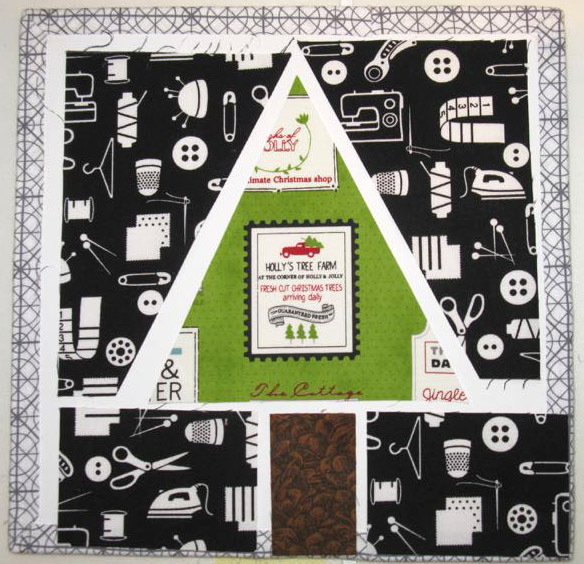 Pingback: Winter Pines | OccasionalPiece--Quilt!